After a competition involving thirty or so tenders, designs by the local architect William Inwood, in collaboration with his son Henry William Inwood, were accepted. The builder was Isaac Seabrook. The church was consecrated by the Bishop of London on 7 May 1822, and the sermon was preached by the vicar of St Pancras, James Moore. 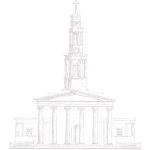 The total cost of the building, including land and furnishings, was £76,679, making it the most expensive church to be built in London since the rebuilding of St Paul’s Cathedral. It was designed to seat 2,500 people. 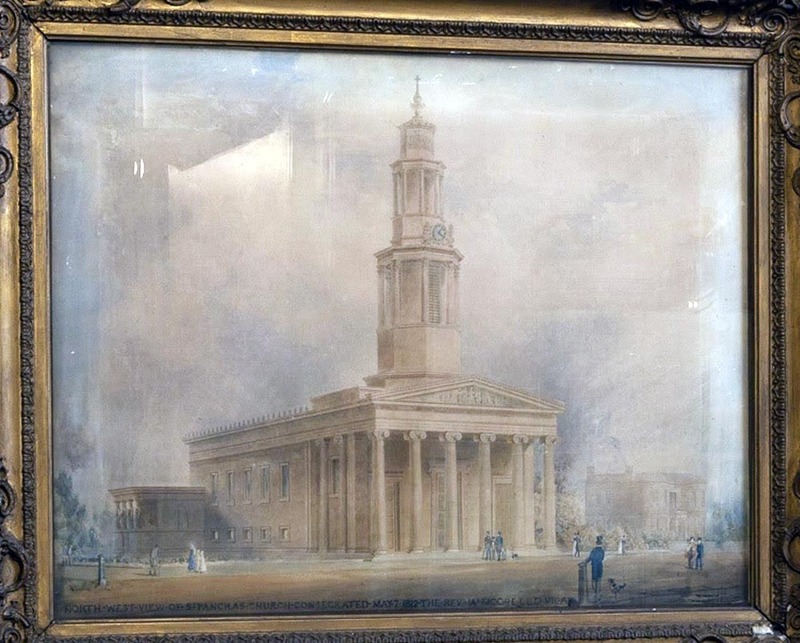 The church has a Grade I listing from English Heritage, as an important early example of the Greek Revival architecture. It is mostly built from brick, faced with Portland stone. The portico and the tower are entirely of stone. All the external decoration, including the capitals of the columns, is of terracotta. 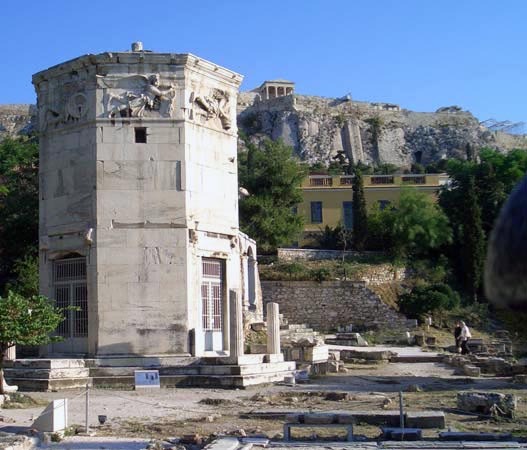 The Inwoods drew on two ancient Greek monuments for their inspiration – the Erechtheum and the Tower of the Winds, both on the Acropolis in Athens. Henry William Inwood was in Athens at the time that the plans for St Pancras were accepted, and he brought back to England plaster casts of details of the Erechtheum, and some excavated fragments. The pillars at the west end of the church are Ionic in style. The octagonal tower, modelled on the Tower of the Winds, also influences the shape of the domed central vestibule. 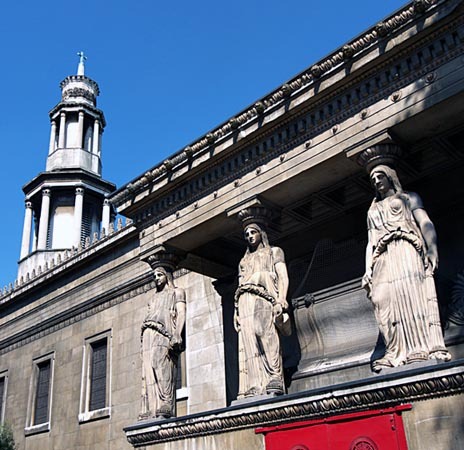 The church’s most celebrated features are the two sets of caryatids that stand above the north and south entrances to the Crypt. Unlike the original figures on the Acropolis, each of the St Pancras caryatids holds an extinguished torch or an empty jug, reflecting their position as guardians of the dead. 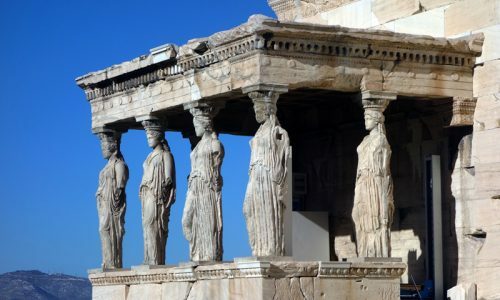 The caryatids are made of terracotta, constructed in sections around cast-iron columns, and were modelled by John Charles Felix Rossi, who provided all the terracotta on the building.